Derek Pattle gave the Immortal Memory at a Burns Supper organised to raise funds for St Michael’s Day Care Centre in Linlithgow and held in the Queen Margaret Hall on Friday of last week. And, being a Sassenach, he had a slightly different take on the subject. 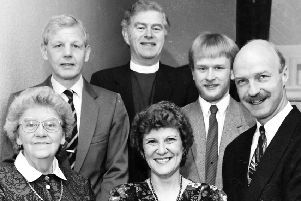 The top table guests are pictured above and are (left to right) Derek Pattle, Jill Pattle, Donald Burgess, Bert Lawson, chairman, St Michael’s Day Care Centre, Jill Auld and Alistair Auld. The event raised in the region of £100 in funds for the day care centre. Donald Burgess enthralled his audience with Tam o Shanter while Alistair gave the toast ‘‘To the Lasses’’ with his wife, Jill, responding. Bert Lawson said the organisers were delghted with the success of the event and the total amount raised by the supper.